If you’re having trouble showcasing displays due to space restraints, try adding Black Slatwall Gondolas to your store. 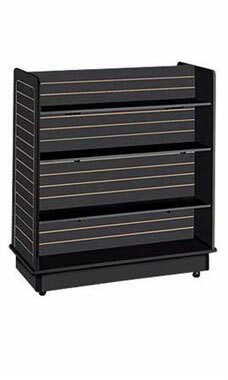 These display merchandisers have six durable shelves made for bulky products and displays. The unit has the capacity for grand merchandise displays without sacrificing appearance. They allow products and displays to stand out instead of being hidden by a distracting display medium. The Black Slatwall Gondola comes with six shelves and brackets. The unit is 24"W x 48"L x 54"H with a 6"H base and comes with casters. They are in stock and available for immediate purchase to improve the quality of your displays!